Organic light-emitting diodes (OLEDs) have emerged as the leading technology for the new display and lighting market. OLEDs are solid-state devices composed of thin films of organic molecules that create light with the application of electricity. OLEDs can provide brighter, crisper displays on electronic devices and use less power than conventional light-emitting diodes (LEDs) or liquid crystal displays (LCDs) used today. 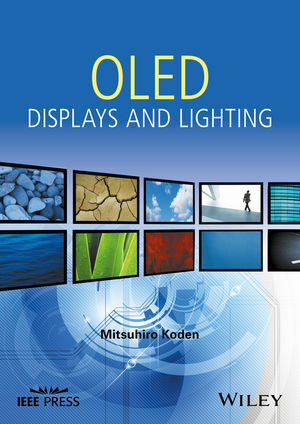 This book covers both the fundamentals and practical applications of flat and flexible OLEDs. Covers all of the aspects necessary to the design and manufacturing of OLED displays and lighting. Explains the fundamental basic technologies and also related technologies which might contribute to the next innovation in the industry. Provides several indications for future innovation in the OLED industry. Includes coverage of OLED vacuum deposition type and solution type materials. The book is essential reading for early career engineers developing OLED devices and OLED related technologies in industrial companies, such as OLED device fabrication companies. Dr. Koden is currently a Professor at the Innovation Center for Organic Electronics (INOEL) at Yamagata University, Japan. He is the author/ co-author of more than 70 papers and articles, and is the inventor of more than 150 patents. Prof. Koden has extensive R&D industrial experience from his 30 year career at Sharp Corporation.